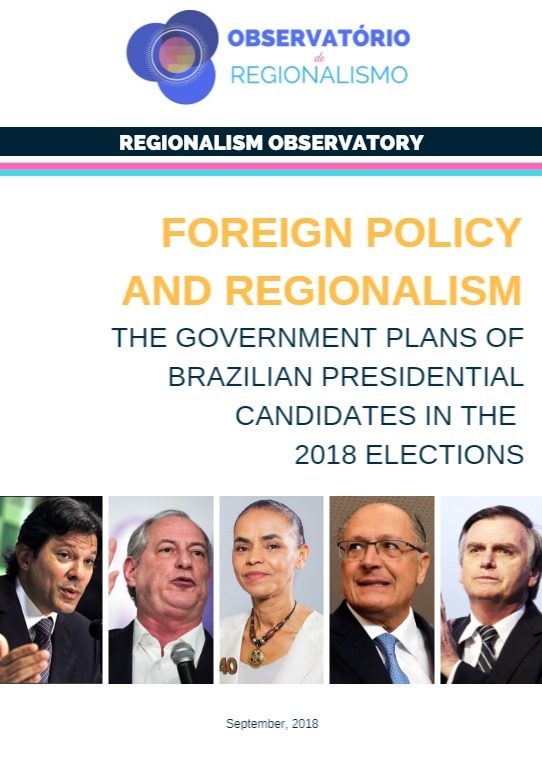 On the occasion of the current presidential elections in Brazil, the Regionalism Observatory presents a special publication, the “Foreign Policy and Regionalism Dossier: the Government Plans of Brazilian Presidential Candidates in the 2018 Elections”, an exclusive edition that aims to analyze how foreign policy and regionalism are included in the programs of the main candidacies. Through this collective initiative, the Regionalism Observatory aims to instigate reflection on foreign policy and regionalism issues and thus to contribute to the debate of such ideas, which is even more necessary in electoral periods. The Dossier, therefore, results in the publication of an informative content, interesting to professors, students, researchers and professionals in international relations, as well as to the general public who seek to inform themselves about the topic. The production is the result of the collaboration of several researchers, members of the Regionalism Observatory, who have contributed as organizers, authors, reviewers, and graphics editor. The group also relied on the support of its host institution, the Graduate Program in International Relations San Tiago Dantas (UNESP – UNICAMP – PUC-SP) and the Research Network on Foreign Policy and Regionalism (REPRI). The Dossier is also available in the original Portuguese version here. Subscribe to our website for weekly updates on the Regionalism Observatory’s publications, and follow the ODR profile on social networks.